A research team has observed structures racing out from the centre of a young star’s debris disk at high speeds. “It looks as if someone had smudged a freshly painted picture into a wavy line with their finger,” says ETH astrophysicist Christian Thalmann. “We were speechless when we saw the image for the first time in the control room at the observatory in Chile,” remembers Christian Thalmann of the Institute for Astronomy at ETH Zurich, who is also a member of the National Centre of Competence in Research PlanetS and a Marie Curie fellow. Together with a team of international colleagues, he was using the European Southern Observatory’s (ESO) Very Large Telescope (VLT) to observe the celestial object AU Microscopii, a young star in our cosmic neighbourhood that is “only” 23 light years away. Astronomers have known for years that AU Mic is surrounded by a debris disk. Now, however, a newly installed instrument named SPHERE has allowed them to resolve the inner part of the disk clearly for the first time. The researchers were even more surprised when they compared the new images with data obtained using the Hubble Space Telescope in 2010 and 2011. The older images already hinted at some of the wavy or bow-like structures. “We therefore contacted the authors of that study and processed their data again together,” recalls the ETH researcher. This allowed the team to trace the structures’ development back over a period of five years. The result: the bows are moving outwards from the star at unexpectedly high speeds of up to 40,000 kilometres per hour. As the international team under lead author Anthony Boccaletti reports in Nature, the structures cannot be bound on closed orbits around AU Mic, but rather are being ejected from the system altogether. In order to understand this mysterious phenomenon, the researchers intend to monitor the structures’ subsequent movement and development through regular follow-up observations, and to obtain further information on the spatial arrangement and chemical composition of the dust. “And, of course, if a previously undiscovered planet should be part of the puzzle, we also hope to find it,” says Christian Thalmann. Anthony Boccaletti, Christian Thalmann, et al. 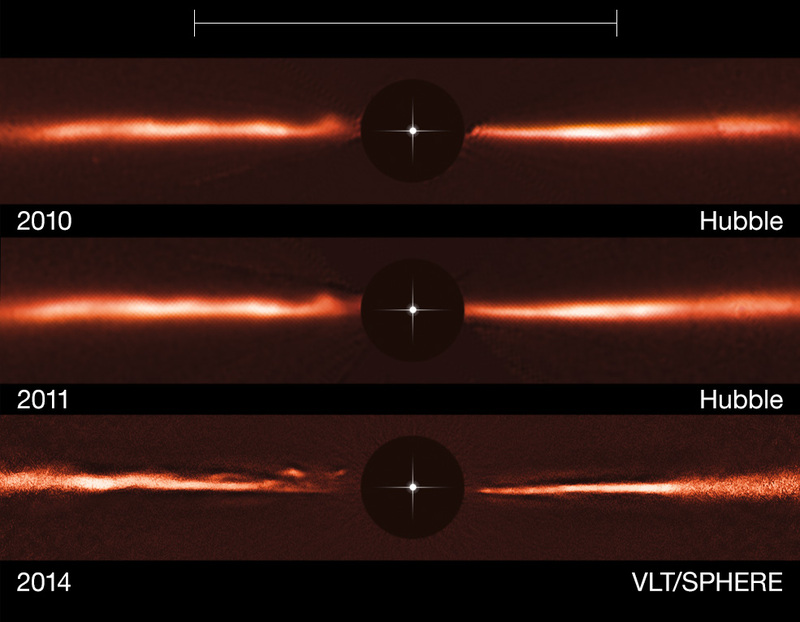 : “Fast-Moving Structures in the Debris Disk Around AU Microscopii”, Nature, 8 October 2015.